Channeling the vibrant imaginations of children, a kaleidoscopic theme of striking art installations, colorful signage and a Techicolor lounge welcomed childrenswear professionals to the recent Pitti Bimbo show in Florence, Italy. The 87th edition hosted nearly 600 brands debuting their Spring/Summer ’19 collections to more than 5,000 buyers from around the world. 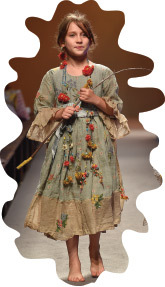 Raffaello Napoleone, CEO of Pitti Immagine, reported a positive show vibe among exhibitors and attendees, reflecting “energy, creativity and dynamism” across the kids’ market. A diverse range of trends were on display. They spanned ’50s influences to eco-warrior to chic innovations in athleisure. Say what you will about industry consolidation at the wholesale and retail levels, the offerings have never been more diverse and plentiful. Athleisure shows little sign of slowing down. Designers are experimenting with fresh takes on sporty comfort. Think suitable for play but chic for street. Sneaker soles are clunkier a la Dad’s shoes, neon accents are bolder, logos are bigger and silhouettes are more versatile than ever. 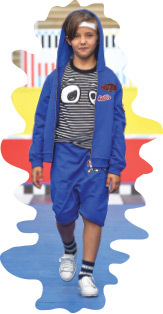 Checkered flag prints, acid shades and bold logos were front-of-the-pack trends at Pitti Bimbo. Other brands went full speed on motocross looks like Carlijnq’s black-and-white check dress, shorts and hoodies and Stefania Pinyagina’s assortment of car-inspired graphic tees. Home-on-the-range is all the rage. Not to be confused with Boho, the “prairie chic” craze is all about frilly feminine tops, ditzy floral prints, midi-length skirts, washed denim and saddlebags straight from Laura Ingalls Wilder’s series. Pitti was flooded with prairie-perfect styles from Péro’s whimsy wildflowers climbing linen dresses to Vineet Rahul’s tiered skirts paired with delicate pastel tops. As vegan and eco-friendly fashion continue to grow in demand among consumers, designers are getting increasingly creative with available natural materials. Kelp, cork and hemp were just some of leather substitutes on display. Silk alternatives have also been found in bamboo or mercerized cotton. Pitti’s “Eco Ethic” section was brimming with brands dedicated to organic materials and respect for the environment throughout the production chain. Exhibitors included J Bimbi, Kidiwi Handmade, Mori, Maxomorra, Naturapura and Pure Cotton. The ’50s are swinging into style. While halter necklines, circle skirts, bolero jackets and scalloped edges blossom in girls’ collections, corduroy playsuits, preppy denim, mix-and-match plaids and novelty checks are on the rise for boys. In fact, Spanish label Monnalisa hosted a garden party dubbed “The Fabulous Fifties,” presenting its selection of retro floral looks to more than 400 guests. Words of empowerment, encouragement and good ol’ girl power have stormed runways of late. The messaging can be found smack in the middle of T-shirts, on the backs of hoodies and down the side of pant legs. Slogan style is also being heard loud and clear across childrenswear. Whether it’s Gardner and the Gang’s “Strong is the New Pretty” pink crewneck or Oji’s Namaste definition tee, wearing feelings on your sleeve has never been more literal—and fashionable.